Make savory short ribs in a rosemary pomegranate sauce with hasselback potatoes. My friend and former boss, Gerry Miller, from my Leo Burnett Company days, challenged me to create a meal appropriate for Passover. 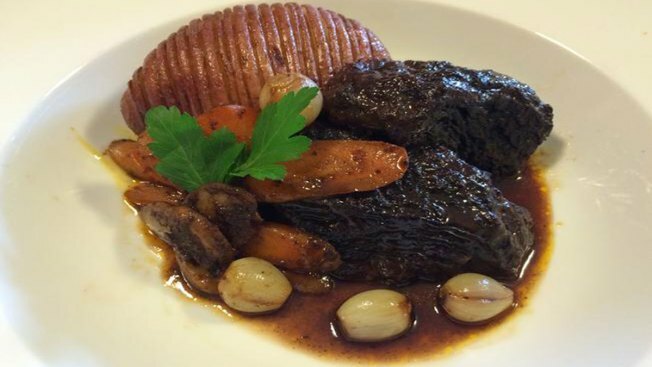 So, I did a little research on appropriate ingredients and created my version of braised short ribs with hasselback potatoes. The braising liquid is a flavorful combination of rosemary, kosher red wine, pomegranate juice and tomato paste. The sauce made from its reduction is rich and savory and adds a nice finish to the short ribs, potatoes and sautéed vegetables. Mix matzo meal, 1 1/2 teaspoons of salt and 1 teaspoon of pepper in a bowl and set aside. Rinse the short ribs in cold water and then squeeze each in a paper towel to dry the surface. Roll each short rib in the matzo mixture and set aside. Heat 2 tablespoons of olive in a large dutch oven over high heat. Working in batches, sear the short ribs for about 2-3 minutes per side. Remove them from the pan and set them aside. Add onions and carrots to the dutch oven and toss in the oil to coat. Sauté for about 2 minutes and stir in celery. Deglaze the pan with 1 cup of red wine, scraping the bottom to loosen all cooked bits. Add tomato paste, beef stock and pomegranate juice. Stir to combine and bring mixture to a simmer. Place short ribs on top of mixture (do not submerge them) and cover with a tight fitting lid or aluminum foil (the tigher the seal, the better). Put dutch oven on a baking sheet and place it in the oven for 3 1/2 hours. Check the braising process after 2 hours. If liquid is low, heat 1-2 cups of beef stock in a small saucepan and add it to the pot. While short ribs are braising, prepare the potatoes. Slice about 1/8” along the flattest surface of each potato to create a bottom. Place the potato on a cutting board and make multiple cross cuts as close to each other as possible, each stopping about 1/2” before slicing all the way through. Repeat with remaining potatoes. Place potatoes on a baking sheet and season with salt and rosemary. Drizzle olive oil over the top. Place potatoes in the oven along with the short ribs about 45 minutes before short ribs are done. They will take about 55-60 minutes to roast. After short ribs have braised for 3 1/2 hours, carefully remove them from the dutch oven cover with aluminum. Strain the liquid from the dutch oven into fat separator or large bowl. Discard the braising vegetables. Skim off the excess fat and pour the liquid into a saucepan over medium heat. Cook the sauce down until it thickens and coats the back of a spoon. Meanwhile, sauté pearl onions, carrots and mushrooms in a large saucepan with 1 tablespoon of olive oil over medium-high heat until just tender, about 7 minutes. Pour about 2 tablespoons of the sauce reduction into the vegetables and toss to coat. Remove potatoes from the oven after 55-60 minutes total baking time. Place a potato on each serving plate or bowl. Divide short ribs among the plates. Arrange the sautéed vegetables on the side and pour the sauce reduction over the potatoes and short ribs. Garnish with parsley and serve. *Peeling pearl onions - an easy way to peel pearl onions is to trim off the root end of each onion and drop them into slated boiling water for about 1 1/2 minutes. Then trasnfer them to an ice bath until cool. Pinch from the end opposite the root end and the peel should slide off.